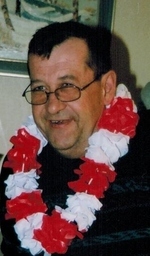 Dean Oblin Obituary - Haileybury, Ontario | Buffam Leveille Funeral Home Ltd. The family is heartbroken to announce the sudden death of son and brother, Dean Oblin, after a brief battle with cancer. With his sisters at his side, he passed away at Health Sciences North in Sudbury on Tuesday September 19, 2017 at the age of 58. Dean was a confirmed bachelor, marched to the beat of his own drum and fearlessly found adventure wherever he chose. He was an excellent pool player, having honed his skills from an early age growing up above the pool hall his father owned in Cobalt. It wasn’t long before he was besting many of the regulars even though he could barely reach the table to shoot. He was very intelligent and great with facts and figures. He was mostly self-taught, learning from life experiences. He had an infectious laugh, a great sense of humour, even at the end, loved people and was well liked by everyone he met. At 16 he decided to visit Jamaica on his own and with his own money. He later travelled in western Canada doing various jobs including cherry picking in B.C.’s Osoyoos Valley. He spent many years in Alberta, briefly worked the oilfields and earned money wherever he could. He then travelled in Ontario and even tried his hand at summer jobs with the Ministry of Natural Resources. He was passionate about watching professional football and horseracing and received V.I.P. treatment during frequent trips to Casino Rama. He also had a weakness for Chinese food and thought nothing of driving to Rouyn or North Bay to visit his favourite restaurants. He was predeceased by his mother Shirley Oblin (nee Hart) and survived by his father, Paul Oblin of Firstbrook Township, sisters Sandra (Ken Koski) of Haileybury, Tracey (Charlie) Vos of South Porcupine and Paula (Ron) Benoit of North Bay and brother Robert of Cobalt. He also leaves 5 nieces and nephews, Todd Dufresne of North Bay, Jordan and Emma Oblin of Cobalt, Brenden Benoit of Orillia and Brianna Benoit of North Bay as well as uncles, aunts and cousins. He will be greatly missed. The family wishes to thank the doctors and nurses in the Cardiac Medical Unit at Health Sciences North for their caring and compassionate attention to Dean during his last days. According to his wishes there will be no funeral or memorial service. He has been cremated. His family will gather privately at a later date when his ashes are interred. Dean was born on November 11th so Remembrance Day will forever be extra meaningful to our family. Messages of condolence can be forwarded through the Buffam Leveille Funeral Home in Haileybury. Those wishing to do so are welcome to make a donation on his behalf to a charity of their choice.